123 Edc lamp Warning light permanently off. Short circuit or defective wiring. Check wiring. 124 Cold start lamp Warning light permanently off. Short circuit or defective wiring. Check wiring. 125 Main relay defect Possible problems during after-run. Relay short circuit to battery positive or ground. Check wiring between ECM and battery. 126 Battery voltage Possible problems during after-run. Alternator or battery defective. Possible wiring problem. Check wiring. Replace alternator regulator or battery Replace the alternator if necessary. 127 Engine brake electro valve Engine brake not operational. Relay or wiring short-circuited or interrupted. Check wiring. 128 Main relay – short circuit to battery Possible problems during after-run. Relay short circuit to battery positive or ground. Relay may be faulty. Check wiring between ECM and battery. 129 Air conditioner compressor relay Possible problems during after run. Relay short circuit to battery positive or ground. faulty. Check wiring between ECM and battery. Incorrect use of vehicle. Check the accelerator pedal signal and pedal mechanical movement. 116 Clutch signal suspect The parameter reading shows that the clutch is pressed. Clutch switch faulty or wiring problems in pedal. Check clutch pedal switch and wiring. 117 Brake pedal signal error Slight power re- duction Main and secondary brake switch not synchronised. One of the two brake pedal switches may be stuck. Check the synchronisation of both switches (signal) and wiring. 119 Plausibility + 15 Possible mechanical problem (in pawl) or electrical problem. Check wiring. 121 Speed limiter w / light Warning light permanently off. Short circuit or defective wiring. Check wiring. 122 Warning light ODB Warning light permanently off. Short circuit or defective wiring. Check wiring. 12A Relays for engine brake valve Possible problems during after run. Relay short circuit to battery positive or ground. 12B Thermostarter relay 1 (heater) Heater not working. Relay or wiring short circuited or interrupted. Check wiring. 12C Thermostarter relay 2 Heater not working. Relay or wiring short circuited or interrupted. Check wiring. 12E Management system pre/ post heating (active) Grid heater permanently operating. Grid heater short circuited to ground. Check wiring and component. 131 Coolant temperature sensor No reaction noticeable on behalf of the driver. Sensor short -circuited or value implausible. Check the wiring. Replace sensor if necessary. 132 Coolant temperature sensor (test) Slight power reduction. Operation in extreme environmental conditions or sensor inaccurate. Ensure the engine is not working in extreme environmental conditions. Check the wiring and the sensor accuracy. 133 Air temperature sensor boost air Slight power re- duction. Sensor short circuited or value implausible. Check the wiring. Re- place sensor if necessary. 134 Boost pressure sensor No reaction perceivable by the driver. Parameter recovery value: 2700 mbar. Sensor short circuited or difference between environmental pressure and turbo pressure implausible. Check the wiring. Also check the environ- mental pressure sensor. Replace sensor if necessary. 135 Fuel temperature sensor Slight power re- duction. Sensor short-circuited or value implausible. Check the wiring. Re- place sensor if necessary. 138 Oil pressure sensor No reaction perceivable by the driver. Parameter recovery value: 3000 mbar. Sensor short-circuited or value implausible. Check the wiring and oil level. 13A Oil temperature sensor No reaction perceivable by the driver. 120 C). Sensor short-circuited or value implausible. Check the wiring. Replace sensor if necessary. 13C Atmospheric temperature sensor (humidtiy?) No reaction perceivable by the driver. Parameter recovery value: 40 C. Sensor short-circuited or value implausible. Check the wiring. Replace sensor if necessary. 141 Crankshaft speed No reaction noticeable on behalf of the driver. Signal interrupted or wiring problem. Sensor installation may not be correct. Check wiring and installation. With camshaft sensor No reaction perceivable by the driver. Signal interrupted or wiring problem. 143 Camshaft sensor No reaction perceivable by the driver. Signal interrupted or wiring problem. 144 Fault between fly-Wheel sensor and camshaft No reaction noticeable on behalf of the driver. Signal interrupted or wiring problem. Flywheel and timing sensor installation may be incorrect. Check wiring and installation of both sensors. 145 Fan relay No reaction perceivable by the driver. Fan off. Short circuit or fan actuator faulty. Check the wiring and the fan actuator. Replace the actuator if necessary. 148 Air conditioner compressor relay Air conditioner permanently off. Wiring or relay short-circuited. Check the wiring. Replace relay if necessary. Filter Filter heater not working. Wiring or filter heater short-circuited. Check the wiring. Re- place the filter heater if necessary. 151 Injector cylinder 1 The engine runs on 5 cylinders. Injector no.1 electric trouble. Check correct tightness to torque of the connectors on the solenoid valve of the injector (1.36 – 1.92 Nm). Check the integrity of the injector coil and replace the injector if defective. If the coil is integral, check the wiring between the solenoid valve and EDC -connector. 152 Injector cylinder 2 The engine runs on 5 cylinders. Injector no.2 electric trouble. Check correct tightness to torque of the connectors on the solenoid valve of the injector (1.36 – 1.92 Nm). Check the integrity of the injector coil and replace the injector if defective. If the coil is integral, check the wiring between the solenoid valve and EDC connector. 153 Injector cylinder 3 The engine runs on 5 cylinders. Injector no.3 electric trouble Check correct tightness to torque of the connectors on the solenoid valve of the injector (1.36 – 1.92 Nm). Check the integrity of the injector coil and replace the injector if defective. If the coil is integral, check the wiring between the solenoid valve and EDC connector. Filter Filter heater not working. Wiring or filter heater short-circuited. Check the wiring. Replace the filter heater if necessary. 151 Injector cylinder 1 The engine runs on 5 cylinders. Injector no.1 electric trouble. Check correct tightness to torque of the connectors on the solenoid valve of the injector (1.36 – 1.92 Nm). Check the integrity of the injector coil and replace the injector if defective. If the coil is integral, check the wiring between the solenoid valve and EDC- connector. 152 Injector cylinder 2 The engine runs on 5 cylinders. Injector no.2 electric trouble. Check correct tightness to torque of the connectors on the solenoid valve of the injector (1.36 – 1.92 Nm). Check the integrity of the injector coil and replace the injector if defective. If the coil is integral, check the wiring be- tween the solenoid valve and EDC-connector. 153 Injector cylinder 3 The engine runs on 5 cylinders. Injector no.3 electric trouble Check correct tightness to torque of the connectors on the solenoid valve of the injector (1.36 – 1.92 Nm). Check the integrity of the injector coil and replace the injector if defective. If the coil is integral, check the wiring between the solenoid valve and EDC-connector. electric trouble Check correct tightness to torque of the connectors on the solenoid valve of the injector (1.36 – 1.92 Nm). Check the integrity of the injector coil and replace the injector if defective. If the coil is integral, check the wiring between the solenoid valve and EDC connector. 155 Injector Cylinder 5 The engine runs on 5 cylinders Injector no.5 electric trouble Check correct tightness to torque of the connectors on the solenoid valve of the injector (1.36 – 1.92 Nm). Check the integrity of the injector coil and replace the injector if defective. If the coil is integral, check the wiring between the solenoid valve and EDC connector. 156 Injector Cylinder 6 The engine runs on 5 cylinders Injector no.6 electric trouble Check correct tightness to torque of the connectors on the solenoid valve of the injector (1.36 – 1.92 Nm). Check the integrity of the injector coil and replace the injector if defective. If the coil is integral, check the wiring between the solenoid valve and EDC connector. Injector coil . Possible problem in control unit. Check wiring. Possible internal problem also in ECM. Replace the injector if necessary. 162 Injector Cylinder 2 / short-Circuit One or more injectors (bank 1 or bank 2) not operating. Possible short-circuit in connections. Possible problem in injector coil . Possible problem in control unit. Check wiring. Possible internal problem also in ECM. Replace the injector if necessary. 163 Injector Cylinder 3 / short-Circuit One or more injectors (bank 1 or bank 2) not operating. Possible short circuit in connections. Possible problem in injector coil . Possible problem in control unit. Check wiring. Possible internal problem also in ECM. Replace the injector if necessary. 164 Injector Cylinder 4 / short-Circuit One or more injectors (bank 1 or bank 2) not operating. Possible short-circuit in connections. Possible problem in injector coil . Possible problem in control unit. Check wiring. Possible internal problem also in ECM. Replace the injector if necessary. 165 Injector Cylinder 5 / short-Circuit One or more injectors (bank 1 or bank 2) not operating. Possible short circuit in connections. Possible problem in injector coil . Possible problem in control unit. Check wiring. Possible internal problem also in ECM. Replace the injector if necessary. 166 Injector Cylinder 6 / short-Circuit One or more injectors (bank 1 or bank 2) not operating. Possible short-circuit in connections. Possible problem in injector coil. Possible problem in control unit. Check wiring. Possible internal problem also in ECM. Replace the injector if necessary. unit (capacitor). Check wiring. Possible internal problem also in ECM. Replace the injector if necessary. 16A Injector cylinder 4 / open circuit One or more injectors (bank 1 or bank 2) not operating. Possible injector connection problem (or disconnected internally). Possible problem in control unit (capacitor). Check wiring. Possible internal problem also in ECM. Replace the injector if necessary. 16B Injector cylinder 5 / open Circuit One or more injectors (bank 1 or bank 2) not operating. Possible injector connection problem (or disconnected internally). Possible problem in control unit (capacitor). Check wiring. Possible internal problem also in ECM. Replace the injector if necessary. 16C Injector cylinder 6 / open circuit One or more injectors (bank 1 or bank 2) not operating. Possible injector connection problem (or disconnected internally). Possible problem in control unit (capacitor). Check wiring. Possible internal problem also in ECM. Replace the injector if necessary. 16D Compression test in progress Compression Test in progress. After carrying out the compression test, turn the key OFF (after-run). Was not reached: stop the Engine More than 2 injectors not operating. See individual faults in injectors. 171 Bench 1 cc One or more injectors (bank 1 or bank 2) not operating. Possible injector connection problem. Injectors short-circuited. Check wiring. Possible internal problem also in ECM. Replace the injector if necessary. 173 Bench 2 cc One or more injectors (bank 1 or bank 2) not operating. Possible injector connection problem. 17C Bench 1 injectors check (internal ecu) One or more injectors (bank 1 or bank 2) may not be operating. Fault in control unit. Replace the engine control unit. 189 Egr power St. Short To batt. No fault perceived by the driver. EGR not working. Short circuit or EGR actuator faulty. Check wiring. Replace the EGR actuator if necessary. Electro-valve Poor performance VGT actuator or wiring defective. Check VGT wiring and actuator. TO POSITIVE Poor performance VGT actuator or wiring defective. Check VGT wiring and actuator. 193 TURBINE WHEEL REVS SENSOR Poor performance Air filter blocked or turbine rpm sensor signal implausible. Check the air filter and check parameters linked with the turbine by performing a road test (parameter acquisition). 198 FAULT ON AT LEAST TWO OF THE FOLLOWING SENSORS: TURBINE SPEED, BOOT PRESSUR AND EXHAUST GAS PRESSURE Poor performance Sensor signal implausible. Sensor may be faulty. Determine which turbine component caused the problem. 199 TURBO-CHARGER CONTRO BOOST PRESSURE FAILURE (PCR) Poor performance Turbo sensor or actuator may be faulty. Air filter may be blocked. Check turbine sensors and actuator (parameter acquisition). Check whether air filter is blocked. 19A TURBINE SPEED EXCEEDING EVERY PERMITTED RANGE Poor performance Turbo sensor or actuator may be faulty. Air filter may be blocked. Check turbine sensors and actuator (parameter acquisition). Check whether air filter is blocked. 19B TURBINE IN OVERSPEED (THE FAULT IS NOT DISPLAYED IF IT IS CAUSED BY A LOW ATMOSPERIC PRESSURE) Poor performance Air filter blocked or turbine rpm sensor signal implausible. Check the air filter and check parameters linked with the turbine by performing a road test (parameter acquisition). 19F NOx SENSOR ERROR No effect perceived by the driver. Sensor signal implausible. Nox sensor may be faulty. Check the Nox sensor. DM1DCU No effect perceived by the driver. Problems in the Denoxtronic (on the CAN line). Check wiring. Check and correct any faults in the Denoxtronic control unit. able. Check CAN line wiring. Check Denoxtronic control unit wiring and operation. 1AE HUMIDITY SENSOR No effect perceived by the driver. Sensor short-circuited or faulty. Check wiring Replace sensor if necessary. FROM DENOXTRONIC (EOBD FLASHING LIGHT) No effect perceived by the driver. Problems in AdBlue dosing system. Check the faults in the Denoxtronic and consult the control unit troubleshooting guide. 1B1 ERROR ON CAN CONTROLLER A No effect perceived by the driver. CAN configuration incorrect. CAN connections defective. Terminal resistance not suitable. Check CAN line wiring. Check terminal resistances. 1B2 ERROR ONCAN CONTROLLER B No effect perceived by the driver. CAN configuration incorrect. CAN connections defective. Terminal resistance not suitable. Check CAN line wiring. Check terminal resistances. 1B3 ERROR ON CAN CONTROLLER C No effect perceived by the driver. CAN configuration incorrect. CAN connections defective. Terminal resistance not suitable. Check CAN line wiring. Check terminal resistances. 1B4 TIMEOUT CAN MESSAGE BC2EDC1 No effect perceived by the driver. CAN configuration incorrect. CAN connections defective. Terminal resistance not suitable. Check CAN line wiring. Check BC wiring and operation. 1B5 TIMEOUT CAN MESSAGE VM2EDC No effect perceived by the driver. CAN configuration incorrect. CAN connections defective. Terminal resistance not suitable. Check CAN line wiring. Check VCM wiring and operation. 1B7 ERROR ON MESSAGES CAN IN TRANSMISSION No effect perceived by the driver. CAN configuration incorrect. CAN connections defective. Terminal resistance not suitable. Check CAN line wiring. Check ECM wiring and operation. 1B9 ERROR ON THE EOBD LIGHT MANAGED BY THE CLUSTER) No effect perceived by the driver. MIL/Body Controller warning light defective. Consult the Body Controller troubleshooting guide and check the CAN line. 1BA TIMEOUT CAN MESSAGE DASH DISPLAY No effect perceived by the driver. CAN messages from VCM inconsistent. Consult the VCM troubleshooting guide and check the CAN line. 1BC TIMEOUT CAN MESSAGE AMBCOND No effect perceived by the driver. CAN messages from VCM in- consistent. Consult the VCM troubleshooting guide and check the CAN line. 1BD TIMEOUT CAN MESSAGE CCVS No effect perceived by the driver. CAN messages from VCM or BC inconsistent. Consult the VCM /BC troubleshooting guide and check the CAN line. 1C2 ERROR MESSAGE CAN ETC1 No effect perceived by the driver. CAN messages from ETC (gearbox) inconsistent. Check the ETC connection with the CAN line. 1C3 TIMEOUT IN RECEIVING TC01 CAN MESSAGE No effect perceived by the driver. CAN messages from TCO in- consistent. Check the TCO connection with the CAN line. 1C6 ERROR MESSAGE CAN TSC1PE No effect perceived by the driver. CAN messages from TCU (Transmission Control Unit) inconsistent. Check the TCU connection with the CAN line. 1C8 ERROR MESSAGE CAN TSC1VE No effect perceived by the driver. 1D1 ECU OVERRUN MONITORING ERROR No effect perceived by the driver. Electrical interference or internal control unit problems. If the error persists to replace ECU. 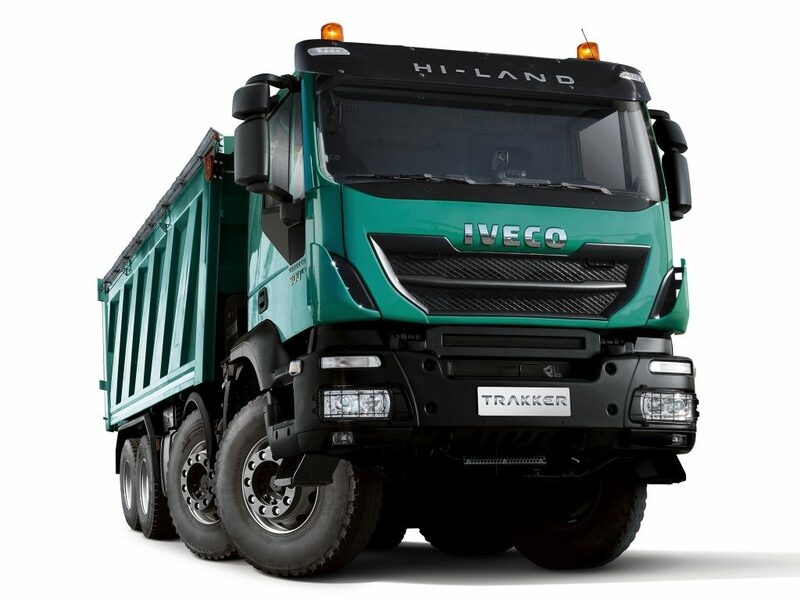 1D2 ECU OVERRUN MONITORING ERROR No effect perceived by the driver. Poor control unit programming/flash Possible internal fault. Reprogram the central unit. If the error is repeated, replace the central unit, if needed. 1D3 ECU OVERRUN MONITORING ERROR No effect perceived by the driver. 1D4 ECU OVERRUN MONITORING ERROR No effect perceived by the driver. Ecu internal failure. If the error persists to replace ECU. 1D5 ECU OVERRUN MONI- TORING ERROR No effect perceived by the driver. Ecu internal failure. If the error persists to replace ECU. 1D6 ECU INTERNAL ERROR (TPU) Control unit deactivation. Electronic interference or control unit faulty. If the error persists to replace ECU. 1D8 ECU OVERRUN MONI TORING ERROR No effect perceived by the driver. Ecu internal failure. If the error persists to replace ECU. 1E2 IMMOBILIZER The engine fails to start. Problem in CAN line or immobiliser control unit. Check the Immobiliser control unit is correctly connected. Enter the Immobiliser PIN code during the emergency procedure. 1E3 ERROR FOR ECU INTERNAL MONI TORING No effect perceived by the driver. Ecu internal failure. If the error persists to replace ECU. 1E4 ERROR FOR ECU INTERNAL MONITORING No effect perceived by the driver. Ecu internal failure. If the error persists to replace ECU. Battery voltage or possible internal control unit problem. Check battery voltage or connections with the ECM. Replace the control unit if necessary. Battery voltage or possible internal control unit problem Check battery voltage or connections with the ECM. Replace the control unit if necessary. Battery voltage or possible internal control unit problem Check battery voltage or connections with the ECM. Check ECU, if required. Battery voltage or possible internal control unit problem Change ECU. 1FA TOO HIGH NUMBER OF REGENERATIONS DEMAND No reaction perceivable by the driver. Too many filter regenerations carried out. Particulate filter may be blocked. Check filter. 1FB PERMANENT RIGENERATION ON TRAP PARTICLE No reaction perceivable by the driver. Catalytic converter not installed or damaged. Check catalytic converter visually. 1FC FIRST SENSOR EXAUSTED GAS TEMPERATURE No reaction perceivable by the driver. Temperature sensors damaged or incorrectly fitted. Check information and condition of sensors. 21F TOO HIGH EFFICIENCY OF CATALYST SYSTEM No reaction noticeable on behalf of the driver. Actuator coil faulty or not within specified tolerance limits. Check actuator condition. AFTERRUN Slight power reduction. The control unit is turned off by the general switch instead of by the key (k15). Possible problem in main relay or connections. Check wiring and then replace the main relay. 228 MAIN RELAY – SHORT CIRCUIT TO GROUND Slight power reduction. Short circuit in main relay or relay faulty. Check wiring between battery and ECM and then replace the main relay. 232 COOLANT TEMPERATURE SENSOR ABSOLUTE TEST Slight power reduction Extreme environmental conditions or sensor incorrectly adjusted. Ensure the engine is working in non-critical conditions. Check the sensor connections and accuracy. Replace sensor if necessary. 238 OIL LOW PRESSURE Slight power re- duction Sensor incorrectly adjusted or faults in lubrication system. Check the sensor connections and accuracy. Check the lubrication system. 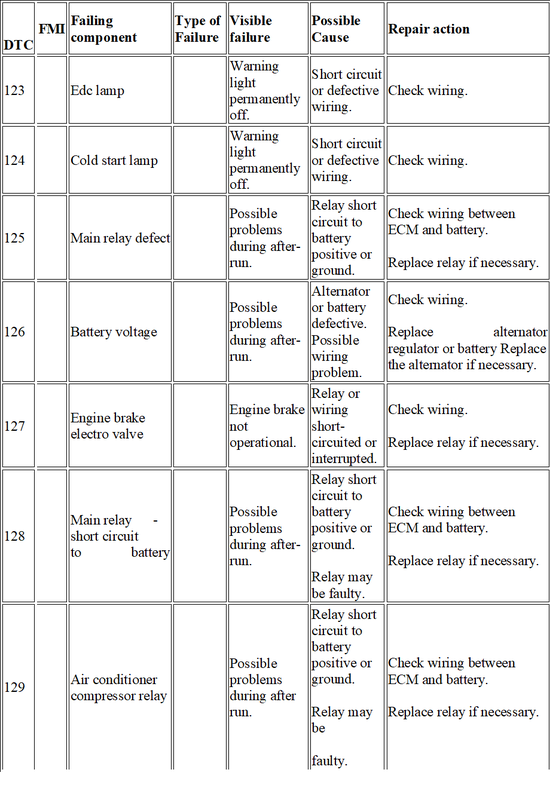 23A OIL TEMPERATURE ABOVE NORMAL Slight power reduction Sensor incorrectly adjusted or faults in lubrication system. Check the sensor connections and accuracy. Check the lubrication system. 27C BENCH 2 INJECTORS CHECK (INTERNAL ECU) One or more injectors (bank 1 or bank 2) may not be operating Fault in control unit. Replace the engine control unit. GROUND Poor performance VGT actuator or wiring defective. Check VGT wiring and actuator. (on the CAN line). Check the faults in the Denoxtronic and consult the control unit troubleshooting guide. Check wiring. LIGHT) No effect perceived by the driver. Problems in AdBlue dosing system. Check the faults in the Denoxtronic and consult the control unit troubleshooting guide. 2B4 TIMEOUT CAN MESSAGE BC2EDC2 No effect perceived by the driver. CAN configuration incorrect. CAN connections defective. Terminal resistance not suitable. Check CAN line wiring. Check BC wiring and operation. 2C6 TIMEOUT OF CAN MESSAGE TSC1-PE PASSIVE No effect perceived by the driver. CAN messages from TCU (Transmission Control Unit) inconsistent. Check the TCU connection with the CAN line. 2C8 ERROR MESSAGE CAN TSC1VR No effect perceived by the driver. CAN messages from TCU (Transmission Control Unit) inconsistent. Check the TCU connection with the CAN line. 2C9 ERROR MESSAGE CAN TIMEDATE No effect perceived by the driver. CAN messages from TC (tachograph) inconsistent. Check the tachograph connection with the CAN line. 2D3 ECU OVERRUN MONITORING ERROR No effect perceived by the driver. Poor control unit programming/flash Possible internal fault. Reprogram the central unit. If the error is repeated, replace the central unit, if needed. 2FF ERROR CHECK OF CRITICAL TIME FOR OIL DILUTION Slight power reduction Oil overdiluted. Change the engine oil . ELECTRO-VALVE Poor performance Connection damaged. Battery voltage excessive (ECU overheating). Check VGT connection and actuator. 3AF SERIOUSE OBD FAULT FROM DENOXTRONIC (EOBD FLASHING LIGHT) No effect perceived by the driver. Problems in AdBlue dosing system. Check the faults in the Denoxtronic and consult the control unit troubleshooting guide. Control Unit) inconsistent. Check the TCU connection with the CAN line. 3C9 ERROR MESSAGE CAN HRDV No effect perceived by the driver. CAN configuration incorrect. CAN connections defective. Terminal resistance not suitable. Check CAN line wiring. Check BC wiring and operation. fault. Reprogram the central unit. If the error is repeated, replace the central unit, if needed. 3FA REGENERATION DEMAND NUMBER 2 No effect perceived by the driver. Too many regenerations carried out. Check particulate filter and faults in sensors. 4AF SERIOUSE OBD FAULT FROM DENOXTRONIC (EOBD FLASHING LIGHT) No effect perceived by the driver. Problems in AdBlue dosing system. Check the faults in the Denoxtronic and consult the control unit troubleshooting guide. 4C8 TIMEOUT OF CAN MESSAGE TSC1-VR PASSIVE No effect perceived by the driver. CAN messages from TCU (Transmission Control Unit) inconsistent. Check the TCU connection with the CAN line. 4FA REGENERATION DEMAND NUMBER 3 No effect perceived by the driver. Too many regenerations carried out. Check particulate filter and faults in sensors. 5AF DM1DCU SPN5 MESSAGE No effect perceived by the driver. Problems in AdBlue dosing system. Check the faults in the Denoxtronic and consult the control unit troubleshooting guide.